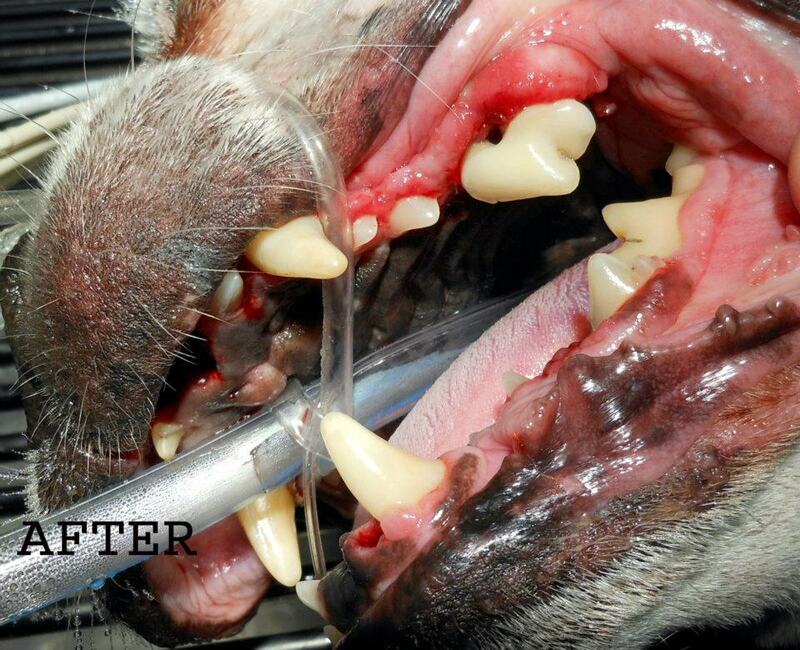 By 3 years of age, 85% of our pets have periodontal disease. Unfortunately, this means your pet probably is affected. 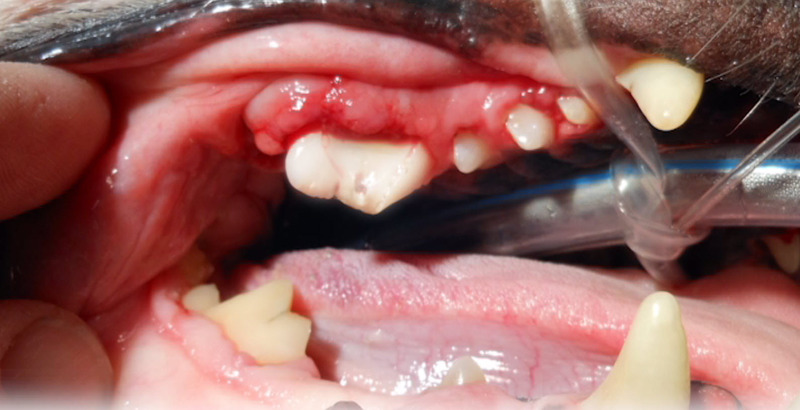 At the start of the dental: the tartar caps are so thick that they're irritating the dog's cheek lining. 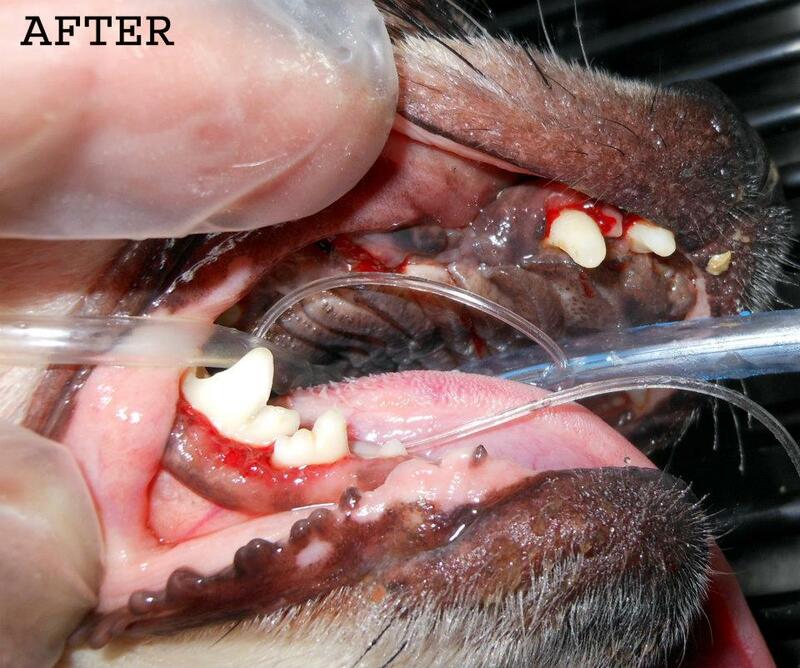 Notice the intense red/purple color of the gums above the huge tartar cap? That's a signal that something major is wrong in the area. Wow! What a difference! The major tooth at the back of the upper left jaw has root exposure and extensive infection of the surrounding tissue. The tooth was sectioned and removed. Soon, this dog will be able to chew in comfort again..
At the start of the dental: rough, layered tartar and very inflamed gums. The small proliferative areas of gum tissue are called "epulis," and are the gingiva's response to chronic infection & inflammation. They commonly are markers for a major hidden problem. Uh-oh: a large section of this major tooth at the back of the upper right jaw is missing, with blood oozing from the pulp cavity. Extraction time--quite a bit of work, as this is a 3-root tooth. 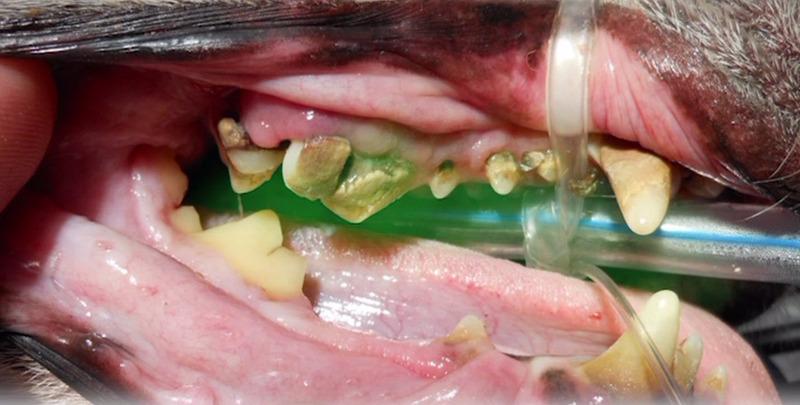 At the start of the dental: look how the gums have been pushed out of the way by the "wraps" of tartar! There is also some thick pus-like discharge emerging from under the gums of the upper incisors at the front of the mouth.. The dental is finished: many teeth were unsalvageable under all that tartar, but the dog will be much more comfortable without them. 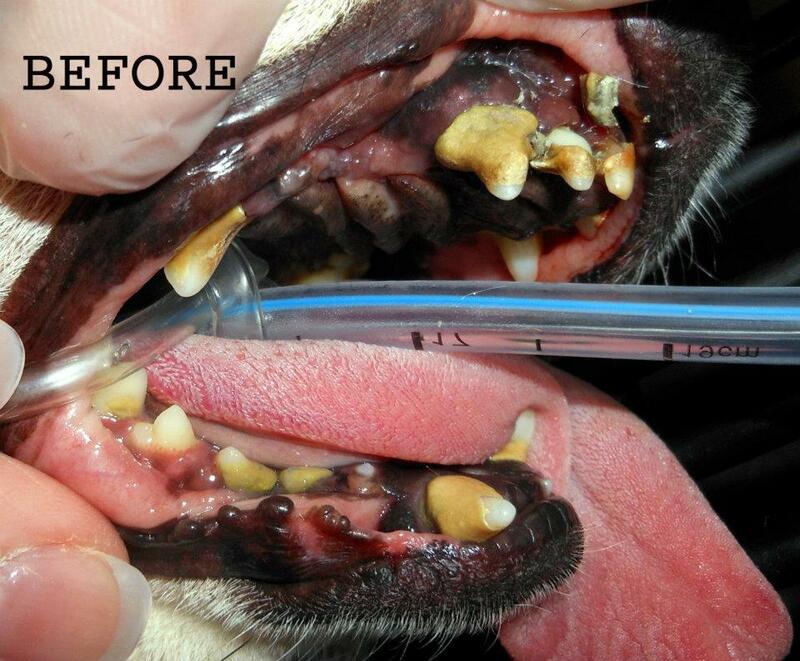 The good news is that good pet dental health care doesn't have to be expensive! Windmill Animal Hospital offers complete dental services for your pet, including dental cleaning/polishing, dental xrays, extractions, and restorative procedures. 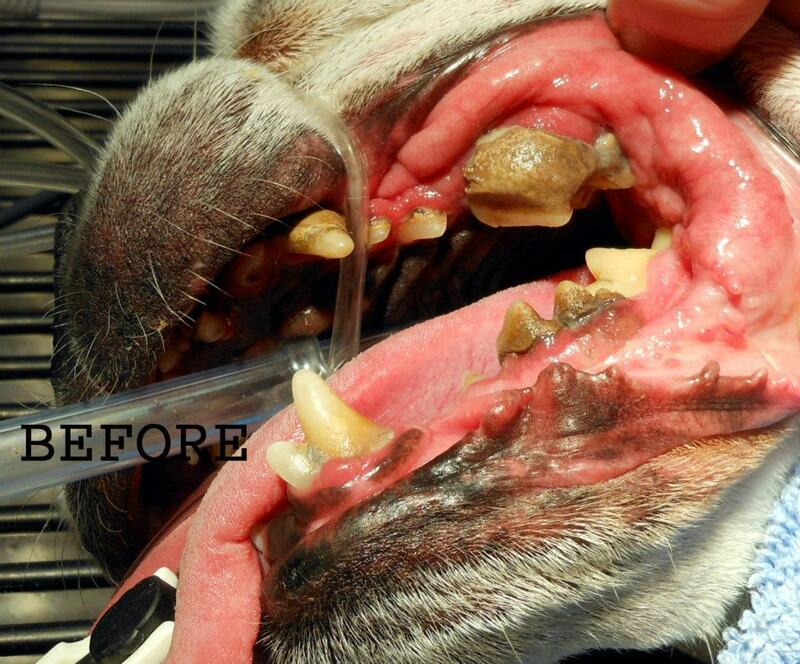 However, if your pet's teeth are cleaned on a regular basis, those other services likely won't be needed! Call today for a dental exam for your pet, and see how easily we can help your pet be healthier and more comfortable with an organized dental maintenance plan.